The basement at the PSC is looking more gorgeous each day. The concrete block walls have been installed allowing for plumbing, fire sprinkler piping and ductwork to be placed in the basement. Large pieces of equipment are being delivered and stored in the basement so that they are available as needed to expidite construction. 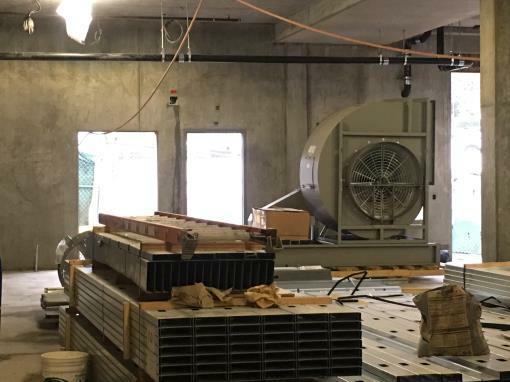 A good example is the 2,400-pound air handling unit, at 13,500 CFM, this fan is designed to circulate air in the basement and exhaust it to the outside.